This was the one that changed everything. 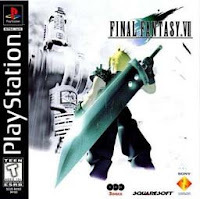 Developed by Square and originally published by Sony Computer Entertainment in 1997 for the Sony PlayStation, Final Fantasy VII was the game that established both companies as powerhouses in the industry. Following the arrival of this one title, PlayStation would go undisputed as the leading platform through two console generations, while Square's Final Fantasy series would be one of the system's key exclusives through those years of dominance. Although the transition to Sony's hardware meant a shift for the series from 2-D sprites to polygons, Final Fantasy VII barely qualified as 3-D. In truth, it was not really any spectacular processing power of the PlayStation that the game took advantage of, but rather the CD-ROM media format, which Square used to store the tons of pre-rendered background graphics and cut scenes. Although the polygonal characters were generated in real time, the environments they navigated were actually all flat 2-D images, only occasionally offering depth by allowing players to move their characters toward the horizon line. It was a style that Square and many other companies utilized to produce visually impressive games that were deceptively far beyond where real-time graphics were actually at. The pre-rendered movie sequences were still being used fairly sparingly. Like its predecessors, FFVII relied primarily on text and limited animation to tell its story, usually cutting to the movies for action sequences that were beyond the PS1's power to generate in real time. It could be jarring to have the characters constantly alternating between the squat, blocky models during exploration mode, the more realistically proportioned characters during battle, and the yet more detailed and smoother pre-rendered characters of the movie sequences. Perhaps because the project was so large, requiring the contracting of multiple outside teams to provide assistance at the expense of consistency, there were even a few cases where the pre-rendered characters were inexplicably super deformed. Subtler but more impressive were the inclusions of frequent smaller background cinematics that were more organically integrated into the experience, resulting in some stunning sequences where pre-rendered environments would seamlessly transition into pre-rendered animated movies, while the player remained able to move the character around. The true 3-D elements were primarily in the battle graphics, which is where, over a decade later, the game looks really rough and dated. Not only did Tetsuya Nomura take over as character designer, but he was also credited as "Battle Visual Director." I'm not sure what that means, but the game did feature some intense battle visuals that may have been an early precursor to the Nomura action style as seen in such projects as Kingdom Hearts II and Final Fantasy VII: Advent Children. Rather than just cutting directly to different angles and closeups as characters attacked, the dynamic camera would rapidly swing around and zoom into the next shot. Such tricks would not be possible working with actual cameras in live action, and I was pleased to see a video game exceeding the limits of its cinematic inspirations instead of merely imitating them. It's not the gameplay that most people remember Final Fantasy VII for, but its mechanics may have been one of its strongest aspects. Combat still operated on the Active Time Battle system, although the pace had been sped up considerably. Character development differed from previous installments in that, while party members still gained experience and levels, magic and skills were actually attached to equipped "materia," which grew independently and could be swapped among characters. Different materia could be fit onto weapons and armor to endow their holders with various traditional spells, techniques, and other abilities, allowing the player to transform nondescript characters into the mages, knights, thieves, etc. of past installments. But the real meat of the system lay with the "support" materia. These had no effect on their own, but, depending on the number and nature of materia slots on a character's equipment, they could be linked with magic or command materia. In order for the "Ice" magic materia to target multiple foes, for example, it needed to be linked with the "All" support materia. Alternatively, linking "Ice" with the "Elemental" materia and attaching both to a weapon would infuse a fighter's basic attacks with the ice element, thereby removing the necessity for an actual "Ice Brand" sword as in previous games. But the combinations could get a lot crazier than that. If you linked "Ice" with the "Added Cut" materia, a character would attack with their weapon after each casting of Ice. If you further linked an additional "Ice" each to the "Steal as well," "HP Absorb," and "MB Absorb" materia, the character could cast the spell, follow with an attack, and then attempt to steal from the enemy, also absorbing a bit of health and MP out of the damage inflicted. But why stop there? Add in a "W Magic" command materia, and the character would go through the entire process twice in one turn. With plenty more materia to experiment with, the game surpassed even Final Fantasy V in offering the deepest and most flexible system yet. On the other hand, you really didn't have to get that devious just to make it through the game, which is probably why the materia system doesn't quite get due credit these days for having been so ingenious. While most of the power lay in the materia, the characters themselves were distinguished by their "Limit Break" desperation attacks, which sometimes differed considerably across characters. Vincent's, for example, essentially transformed him for the rest of the battle into the berserker class of previous installments, while Cait Sith's were basically Setzer's old gambler tricks from Final Fantasy VI. For the other characters, the Limit Breaks were usually just big attacks. One of the irritating failings of the system was that the game never clearly explained how to acquire new Limit Break skills. FFVII is perhaps better remembered for its infamous translation, which was sometimes hilarious, often embarrassing. It was far from the worst Japanese-to-English work, nor anywhere close to Square's worst translation, but there were some blatant errors, as well as some confusing phrasing that could legitimately interfere with the player's understanding. 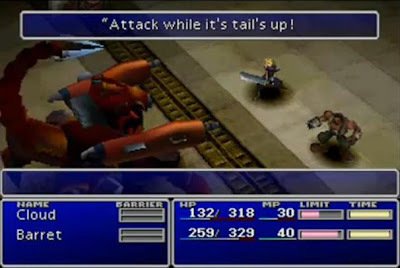 For example, during the very first boss fight, Cloud would warn Barret to watch out for the scorpion mech's tail: "Attack while it's tail's up! It's gonna counterattack with its laser." Ignoring any technical errors, it's hard to tell what Cloud is actually saying. He seems at first to suggest attacking the beast, but then the second line warns that the boss will counterattack. So is attacking while its tail is up a good idea or not? (It's not.) These problems would crop up throughout the game, and they would not be isolated to instructional dialogue. It's difficult to say to what extent the spotty translation compromised the story, which would have been confusing in any case. While I'm sure the sloppy work didn't help, this was the beginning of a new period of deliberately confounding plots and storytelling in Final Fantasy. Kazushige Nojima and Yoshinori Kitase were credited with the story, but the opening credits elaborate that it was "Based on the story" by Hironobu Sakaguchi and Tetsuya Nomura. My rough understanding, based on reading interviews with the key men involved, is that Sakaguchi, with input from Nomura, provided the early concepts and the first script that basically comprised the Midgar episode. Kitase, receiving vague instruction from Sakaguchi to focus on the theme of "life," then heavily revised and expanded it into the core "Cloud vs. Sephiroth" plot, which Nojima then fleshed out into a proper JRPG-length script. Given that this was Kitase's first project as sole director, as well as the first time Nomura held so prominent a position, it's easy to attribute the mind-bending direction to the new blood. But consider the Final Fantasy: The Spirits Within movie, which was Sakaguchi's pet project, with a metaphysical plot bearing myriad similarities to FFVII. If Final Fantasy had morphed into something different from what longtime fans were accustomed to, it's likely that all of these men were collectively culpable. That said, the story was the very reason that so many players fell in love with Final Fantasy VII. Massive in scope and scale, yet intimate in its focused presentation and haunting ambiance, there was more to FFVII's story that I've forgotten than most games in their entireties ever have to say. But there are some moments that I'll probably always remember. 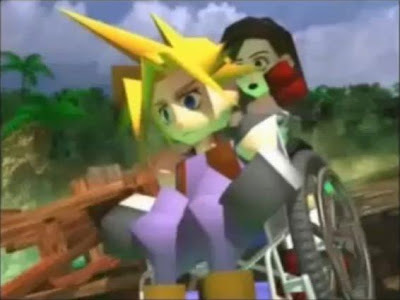 Perhaps surprisingly in retrospect, the wheelchair cinematic notwithstanding, all of Final Fantasy VII's greatest moments were enacted by the crude, pudgy real-time models, seen as shrimpish Lego people from the same distant angles that were usually meant to facilitate map exploration. To me, the greatest scene in FFVII came midway during the first of its three discs, when Cloud and party stopped at Aeris's house to inform her mother, Elmyra, that Aeris had been taken by the enemy. Elmyra, who saw this coming, would then proceed to tell the story of who her daughter really was. I consider this episode to have been this game's equivalent to the opera scene from Final Fantasy VI. Though perhaps dissimilar in content, the sequence exhibited the same all-encompassing mastery in constructing a moment. Evoking pages of a storybook more so than a film reel, images would dissolve into light, and spaces--interiors suspended in limitless black expanses, just like in the 2-D games--would slide across the screen as years flashed by and Elmyra narrated her daughter's growth from a helpless orphan into the willful flower girl that would force her way into Cloud's party. Years before they considered implementing voice acting in a Final Fantasy, Hironobu and team turned as always to Square's resident maestro, Nobuo Uematsu, to carry the scene with his music. 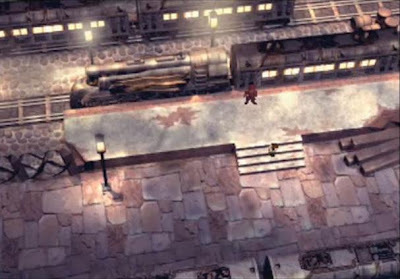 And, just as he had in FFVI delayed the first in-game occurrence of Celes's theme, opting not to have it accompany her introduction, as had been the case with the other characters' leitmotifs, in order to attach it more meaningfully to her defining moment in the opera, it was now this FFVII scene, and not Aeris's introduction, that would first feature the track titled "Aeris's Theme." It's always been hard with these Final Fantasy games to tell whether the adventures transpire over months, weeks, or even just days. We get the sense that we are sharing in the lives of these characters briefly, but for their most vital periods. 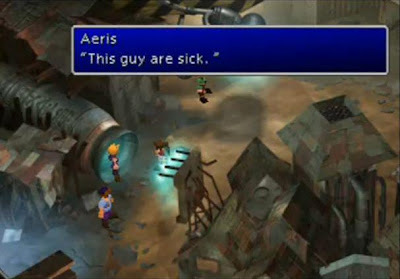 With Final Fantasy VII, Square invited players to observe a character's life in stages, from its beginning to its premature end, and then had the gall to carry on. Aeris's death remains probably the most famous in gaming, and it had become common knowledge years before I played the game. Sometimes I envy those who were able to go into FFVII unspoiled, to have known Aeris without having to always think about her fate. On the other hand, it can be even more affecting to return to a story, experiencing scenes in a new context with knowledge beforehand of how things will turn out. And so it was that, from the first few notes of Nobuo's composition--in fact, the same three notes that began "Aria di Mezzo Caraterre"--I got the sense that I was witnessing something special. I remember reading an interview many years ago where Hironobu Sakaguchi summarized his position on gaming's potential by insisting that you could put a movie in a game, but you could not put a game in a movie. Skeptics would likely scoff at such pretentiousness, while self-proclaimed purists might echo Shigeru Miyamoto's sentiment that video games must be about having fun. While I have enormous respect for Miyamoto's skill as a game designer, I would take issue with any one man defining for others what video games are or ought to be. Technically, Sakaguchi was right in that you can make a movie and then build a game around it. That is essentially the very ambition that his former series still carries even after his departure. Final Fantasy VII reached further than any game before it toward that vision, for, although it could never be mistaken for a film, it did feature a story and storytelling that engaged players, arousing emotions as good films are expected to, yet even good games rarely do. Perhaps because it ended in such an unsatisfying manner, but more likely because there was more milk to be had, post-Hironobu Square Enix would expand FFVII into its own series, first announcing the Final Fantasy VII: Advent Children movie in 2003. Helmed by Nomura and Kitase, the movie also brought back Nojima, Uematsu, and art director Yusuke Naora for a direct sequel to the game. It's debatable whether Advent Children actually provided a better conclusion to the story than FFVII's own cryptic ending, but I enjoyed how the movie managed to adapt the overblown yet curiously protracted combat of video game battles to establish a new style of action. For obvious reasons, it was a far less substantial experience than the game, however, and despite the involvement of so many of the original creators, I had a hard time buying it as canonical. Perhaps it was my idealized memory of FFVII, and not the reality of the game, that the movie failed to live up to. In addition to the movie, the "Compilation of Final Fantasy VII" has included several minor video games, the relevant ones for North America being Dirge of Cerberus (2006) for the PlayStation 2 and Crisis Core (2008) for the PlayStation Portable. I haven't personally played either of the games, but Dirge of Cerberus looked like a pretty wretched Japanese take on the first-person shooter. A semi-sequel/prequel, it did flesh out Vincent's story, which had always seemed incomplete in the original game, but, although the flashbacks impressively managed not to contradict the old material, the new stuff seemed loonier by far than FFVII ever had been. The secret ending to Dirge of Cerberus seemed to point toward another sequel, but there doesn't seem to be anything more in the works right now.